Waterpik Cordless Freedom Water Flosser, $35 after $5 coupon. 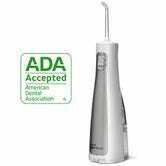 Waterpik is an easier (and they would argue more effective) way to “floss” between your teeth, and Amazon is currently taking $5 off the Waterpik Cordless Freedom flosser, bringing it down to an all-time low $35. That includes three tips and a set of batteries to get you started, but we recommend pairing this with rechargeable Eneloops.